Traveling the globe with kids can be such fun. In this article we’re featuring India! Explore how to create indian recipes with kids that are easy and delicious. Plus discover a few more ways to learn about India. Welcome to “Around The World in 12 Dishes”. We will be taking you on a journey around the world, exploring 12 different countries with our children, by cooking 12 dishes with them. One for each country we visit. We started our journey the same way Phileas Fogg did in London, UK, and Stockholm, Sweden continued on to Moscow in Russia. Now our next stop is New Delhi, capital of the exotic sub-continent of India! 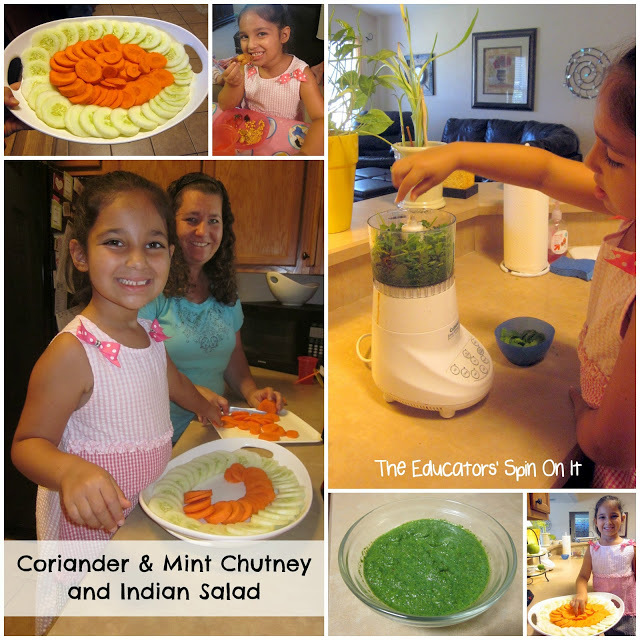 For our first cooking adventure in India we picked some kid friendly recipes and tasks that your child can do in the kitchen with you as they learn about Indian Food. We invited Amanda and her family over for an Indian Family dinner. I had my 5 year old daughter help me prepare the meal. First we started by making a Chutney. My daughter went to the garden and picked the coriander and mint and then rinses and washed them to make Mint Coriander Chutney for our Samosas. Keeping safety rules in mind first, she put the fresh herds into the food processor. Then she added a small pinch of salt and red pepper and a dash of lemon juice and water. Then it was time to close it up and push the on button. Once that was complete she helped me arrange the sliced cucumbers and carrots onto the serving platter for our Indian Salad. My daughter arranged these all by herself, it’s just her way she’s very methodical. Using fresh vegetables is one way to make Indian food a little less spicy and a great way to get veggies in. Now it was time for our guest to arrive for a little cooking fun! 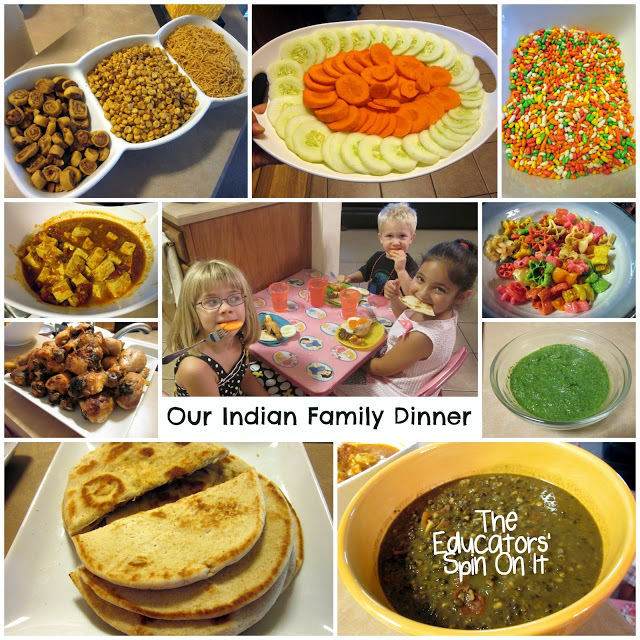 We invited my coblogger, Amanda, and her family for an Indian dinner. 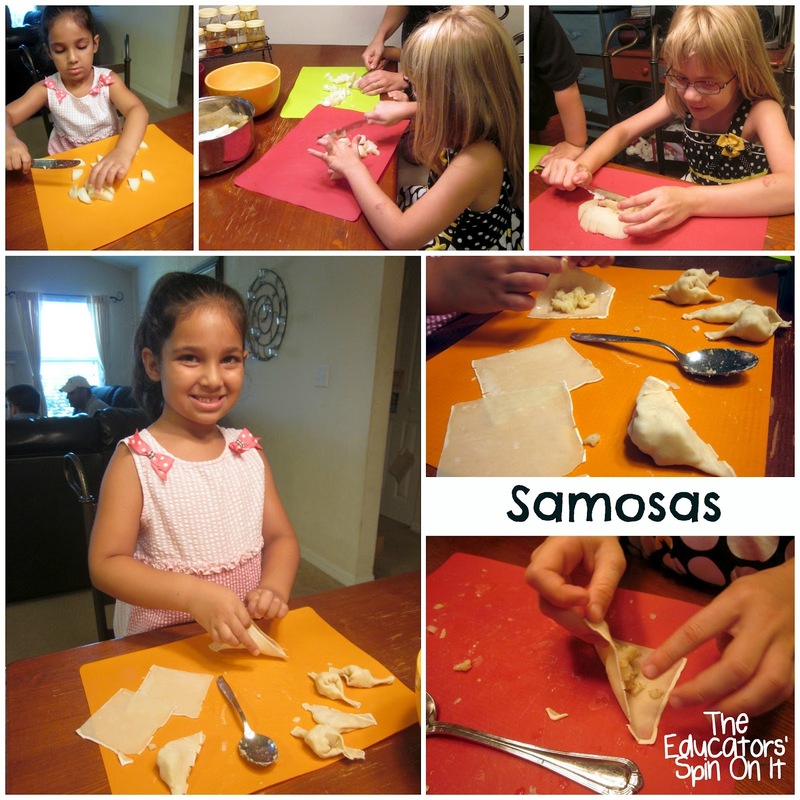 We decided to make Samosas together with the girls to teach them how to make an Indian dish. With just a little prep work it was super easy. First boil your potatoes and dice up the onions. Then mix them both together and add 3 spices. Salt, red pepper and garam masala. Add the spices depending on your family’s liking. We added just a pinch of each, enough to make sure all the potatoes had a little color to them. Then we used Won Ton Wrappers to create our Samosas. They are so easy to use with the kids and cook very easily. When making samosas usually you would use Mata flour, which is like a white all purpose flour mixed with water and oil. Here’s an authentic version recipe of Samosa Dough from Manjula’s Kitchen . To create the samosas I had both girls put a spoonful of potatoes and onion mixture onto the square and then fold it in half after putting water on the edges. Once sealed you fold it again to make a smaller triangle. Then it’s a grown up’s job to fry the samosas until golden brown. We had so much fun making these together! Amanda joined in the fun with her son who’s 2 and my youngest daughter who’s 1. Even our husbands joined the fun so that they could have more to eat! We were so busy eating and making Samosas that we never took a picture of the finished product actually! Guess they were a big hit! We used the mint coriander chutney to dip our samosas in. We also tried tamarind sauce, which is truthfully my favorite and mixed together is delicious. We had so much fun at our Indian Family Dinner and enjoyed comparing it to our Russian Family Dinner last month. It’s fun to see how similar foods can be with ingredients and how different at the same time. For our Indian dinner Menu we selected to share Tandoori Chicken, Dal Mukhani, Shahi Paneer, Indian Salad and Naan. We’ll be sharing more Recipes, Books Activities and Printables about India all month long! Here are a few Activities about India that we’ve shared on our blog, come check them out! Ooohhhhh, I'm gonna have fun coming back here when we study India again when we're doing international geography. I'll need to remember the veggies tip, since ours turned out so spicy. Wow what a feast! Looks good. What are those colored pasta? They look fun 🙂 Can't wait to read the rest. What a yummy food adventure! And isn't it great to be able to pick your own herbs and use them in your cooking 🙂 Thanks for sharing on Happy lil ❤'s are baking!! I love this idea! I'm going to be bookmarking these to read later! Your page says you'll share the Indian recipes in a later post, but I can't find them. Am I misunderstanding or is there a chance you would be willing to share them? ?